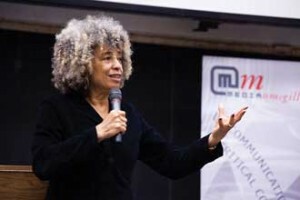 Last Thursday night, Angela Davis, the veteran activist and ‘60s icon of black power politics, was greeted by a rousing ovation in a filled-to-capacity Leacock 132 before she even uttered a word. Davis was on campus to deliver Media@McGill’s Beaverbrook Lecture that sought to take a closer look at the complex relationship between race, power and the media in the U.S.
As she scanned the auditorium, Davis acknowledged that most in attendance weren’t yet born when she first gained infamy in 1970, when she was arrested, charged and tried for three capital crimes – conspiracy, kidnapping and homicide. “Though I was innocent of those charges, it’s clear that had it not been for the massive mobilization of people all over the world, I might still be sitting in one of California’s three women’s prisons,” said Davis. Davis framed her talk with the case of Oscar Grant, the 22-year-old African-American who was fatally shot while allegedly being handcuffed, face-down, on a train platform by a white transit police officer in Oakland on Jan. 1, 2009. The incident, from many vantage points, was captured on cell phone cameras held by passengers on the train idling next to the platform. The clips were subsequently broadcast on TV news and spread like wildfire across the Web, prompting an enraged community to protest and riot over the days that followed. Well over 1,000 people attended Davis’s lecture. Leacock 132, which seats 800, filled-up quickly and an overflow room upstairs that seats another 300 was filled to standing room only. Davis, now in her mid-60s, continues to push for racial and gender equality, gay rights, and prison abolition alongside her work as a professor at the University of California at Santa Cruz.